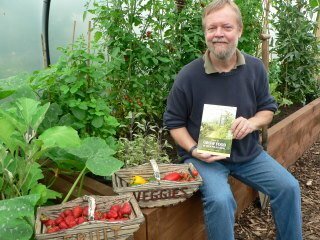 Home Knowledge Books Mark Gatter visits First Tunnels Polytunnel. Both Mark Gatter & Andy Mckee have an absolute passion for polytunnels and this is certainly portrayed in their books. They previously wrote the very succesfull “Polytunnel Handbook” which covers various aspects of polytunnel use from planning your purchase to harvesting the rewards. Mark Gatter’s “How To Grow Food in Your Polytunnel – All Year Round” is a fantastic resource for those who are new to polytunnel gardening, as well as for those who want to expand on and improve their polytunnel growing efforts. Learn what and how to grow, season by season, including how to plan for the hungry gap and how to deal with a wide range of common polytunnel pests. Mark says ” I had a great time and it was also a pleasure for me to meet everyone at First Tunnels”. My wife says this is a picture of me ‘in my natural habitat’.